No-one knows the name of the IRAKi trainee who built the test rig. The comms regarding the live stream of the experiment were all signed Snood and it is assumed that this was a new pseudonym designed to protect the individual's identity in case of mishap. He also took great care to conceal his face from the recording of him entering the transmission cage. The basis of the experiment was simple. The experiment was to discover what would happen if a human-sized transmitting cage was emtied into an identically sized receiving cage that was attached, by a 4 metre aluminium scaffold, to the transmitting cage. Snood may have been an idiot, but he was no fool. EMTI matter transmission was instantaneous and he realised that if this system could be made to work he would have solved one of the last remaining technological barriers for the long-term continuance of the human race i.e. instantaneous, off-planet travel. He had apparently experimented with several low-power models (surmised from the series of hollow bowls carved into his workbench that can be clearly seen in the recording) but all he had witnessed were disappearances - he had no clue where the models had been sent to. He decided he needed to build a rig that was large enough to transport a human being - himself - in order to find out where the EMTIs were going. So, at half past three on Monday 5th August in IRAK's Malibu research facility at Point Dume, and while humming set the controls for the heart of the sun Snood stepped into the cage wearing a full spacesuit and carrying a tupperware box of home-made Vegemite sandwiches and pressed a button that he hoped would bring him immortality - he may very well have achieved it. The census data was stored in Los Angeles-based archives. California was home to a significant population of so-called illegal aliens who chose to stay under the radar. A staggering number of people dropped off presence awareness while the surveillance networks were self-healing and reconfiguring. No insurance company on Earth could afford to admit that anyone actually died. However, one fact that can be authenticated is that 55,487,384 people instantaneously stopped paying taxes. Whether they are dead, in stasis, in hiding or never even existed is, was and always will be irrelevant to the IRS. The 'presumed' status is the subject of the longest legal battle in Earth's history. Research carried out by an army of insurance assessors has proved that there was negligible heat generated by the disappearance. This has been taken to infer that physical force was not involved and that what occurred was some form of space-time phenomena. Temporal anomalies are classified as 'Force Majeure' or 'Acts of God' by all insurance companies so therefore fall outside of any insured cover. They also argue that as California may be only temporarily temporally misplaced, it could reappear at any moment and all claims would then become null and void. After years of battling through the international courts, the dispute over ownership of the bay was finally settled in IRAK's favour, despite strong opposition from both Mexico and the USA. Arizona, finally finding a use for all that sand, built the longest beach in the world and created the Earth's first Rim Culture by festooning the crater walls with live entertainment venues, boutique hotels and precipitously hanging gardens. 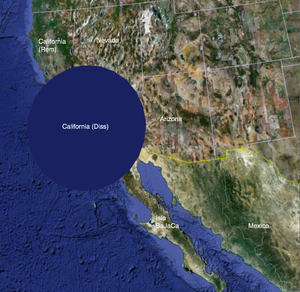 Although the event is called the California Disappearance, a considerable part of California remains. San Francisco, San Jose, Stockton and Sacramento were spared. The somewhat traumatised inhabitants demanded the right to name the resulting bay. A remains-of-the-state-wide vote was held and Arizona Bay won by a landslide . ↑ which it most definitely will, folks - ARE YOU PAYING ATTENTION? This page was last edited on 27 July 2011, at 18:29.